NeverSeconds: Hello again from Frankfurt am Main. Hello again from Frankfurt am Main. Last week my younger daughter didn’t go to daycare twice because she had dentist appointments. I wanted to pick her up from school but was early and she hadn’t been to lunch yet so I went to the canteen with her. 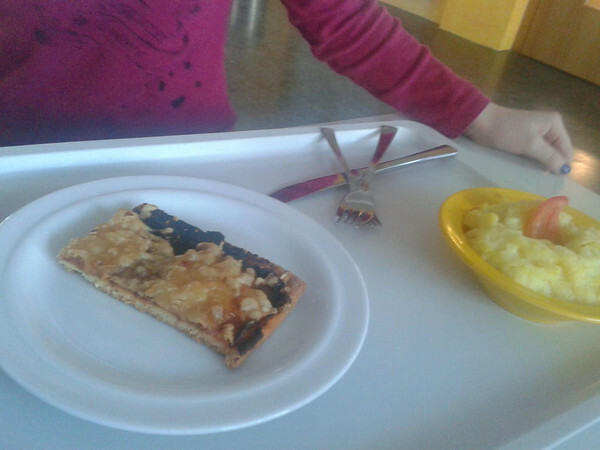 On Thursday, the children had the choice between ratatouille with rice and fish sticks with potatoes and rémoulade. Friday’s menu offered different kinds of pizza and salad. At least that’s what the sign at the entrance said. My daughter went for the fish … uhm … thing on thursday. It was some sort of slobber with greenish spots – I assume they were herbs of some kind – held together by a concrete-like shell of breadcrumbs. She was given a large blob of ketchup with it because there wasn’t any rémoulade (which she would have preferred). She didn’t even ask for potatoes or rice as sides “because they’re never good, either they’re still hard or there’s too much salt”. 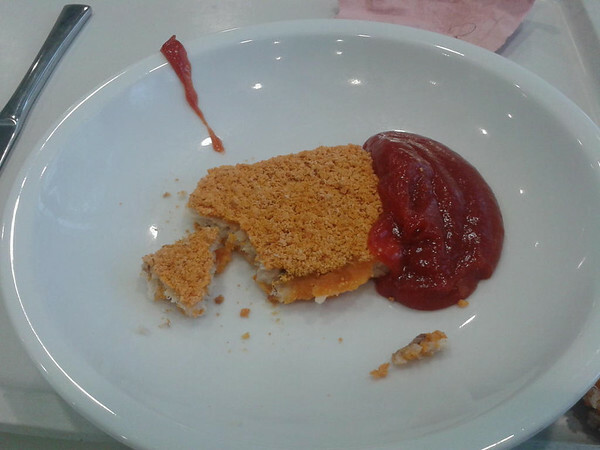 However, I took a bite of this fish thing: it was cold, the crust bone-dry and the slobber inside had a fish-like taste but was as far from fish filet as it could possibly be. Friday’s lunch: Pizza. One of the children’s favourite. It came in the size and texture of crisp bread. The tomato sauce was burnt to charcoal and the salami could not be found. Again, the food was cold. I asked my daughter to get herself some salad and for reasons I don’t understand the only choice that day was potato salad (which in my opinion doesn’t go with pizza, but oh well…). It was surprisingly good but I guess it wasn’t cooked there but bought in large buckets. My daughter and her friends said that usually the pizza is a lot better, usually the best tasting food offered at the canteen. They also said that the food isn’t always that bad. Usually, I'm not picky but I wouldn't want any of those two meals on my plate. And I'm no longer surprised that my child comes home hungry quite often. Yes bacause healthy food is always worse than burned pizza?! How dare you... Finland has free and good school meals! We are so lucky we don't have to eat junk food and pay for it! I never thought that canteen meals in Frankfurt are such bad! Unbelievable! May I ask what are you paying for this meals? We pay 3,00 € per meal, Stadt Frankfurt adds another 1,50 €. Families on welfare or with low incomes who own the Frankfurt Pass pay 1,00 €. I totally agree that food should never become that bad. I don't expect Paul Bocuse standards in school kitchens but the meals ought to be edible. The pictures above were taken during the last week of November. Meanwhile, fish sticks were on the menu again. This time my daughter said that they were really good as was the potato salad and the rémoulade that came along. She had three helpings that day. I would like to think that the two meals I saw were exceptions to the rule. However, I saw that quite a number of children brought their lunches from home, some of them carried hot meals in thermos containers. I guess that means that some parents gave up taking chances and want to make sure their children have a good meal every day. And I thought Martha's meals were of a poor standard when her blog started. Looks like a lot of countries standards need to be raised for school meals. Coming straight after seeing those great Japanese school lunches makes them look really bad sort of like Marthas school used to serve. Please don't tell me that she ate it. That's a disgraceful lunch. My girls take lunch from home because our school dinners are very similar to these so I prefer to 'know' they're getting healthy food that I send rather than poor tasting rubbish. My girls all eat their lunches and never complain about being hungry. Perhaps it would be better for you to send a lunch rather than waste money on this sort of 'food'. When will Veg do more pics of her meals. The blog is getting boring now. There is an astounding lack of nutrients in both of those meals. Perhaps the cooks and authorities need to attend a class on how to feed children so that they grow well and have the mental capacity to learn effectively. If the parents around there are part of a school support group, you should bring this to their attention. If enough support groups start bringing this to the local school board's attention, as well as to the local media, and basically just raising awareness all around, you will see changes made. This needs to change. That is truly a sad report. and pictures do not lie; both main dishes look like hell - and even look cold. I think this Mom should consider packing a school lunch for her daughter. Then send your child with food............. making food healthy and gourmet for huge groups is not cheap. Give it a shot- make one meal for a minimum of 100 kids and see how it turns out and how much money you spend. My guess is you'll need to pay more for your child's schooling if you'd like to be so critical. Or you know, MAKE IT YOURSELF. hey! because of you i created my own blog, the address is noschoollunch.blogspot.com. i am from Salt Lake City Utah, in the USA, and i was asking permission for the use of your rating system? i am 11 (Well, 23 days :) ), and i love your blog! i am so proud and surprised that you had just thought that friends and family would see this and it turns into 2,000,000+! that is so cool, you are my role model! So, you could also email at Khara_aulbach@yahoo.com. please get back to me, i don't want to plagiarize!